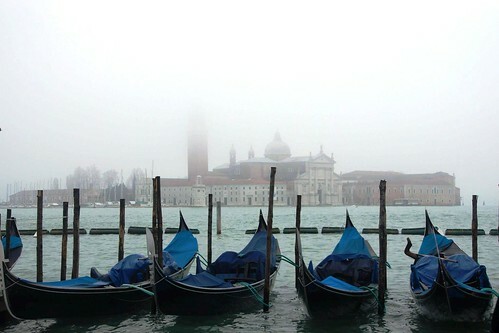 Cat Mills says winter is the best time to visit Venice – when the canals are veiled in mist and the summer crowds have gone. After living in Malta for several months, my partner and I were getting restless. The monotony of regular everyday life was setting in: we’d get up in the morning, have breakfast, go to work, come home and watch a movie. It’s a nice life, but so predictable. So one day, in an attempt to cast off the shackles of reality, we booked the cheapest flight we could find, which just happened to be to Venice. What a welcome retreat it was. In the middle of winter, Venice might not your first choice for holiday destinations, but I would encourage you to think twice. That being said, Venice is damp and there is a frosty mist that almost follows you around before sinking into your bones. The temperature was made especially challenging for me considering that in the rush to the airport I had somehow managed to forget my coat. My partner came to the rescue with the thermal wear he normally brings skiing but had decided to take with us – lucky for me. We had also been warned about the tendency for the city to flood – sometimes so much that you need to wear thigh-high wading boots to get through the streets. Needless to say, we were concerned as to what a chilly weekend in Venice would bring us. 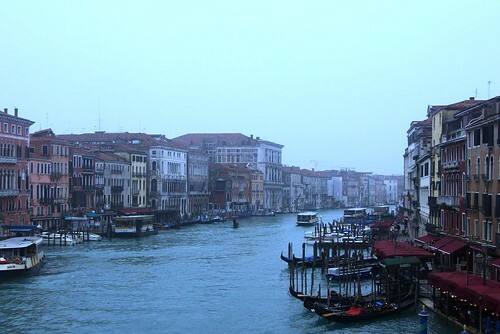 But the wet weather did nothing to detract from what an incredible and surreal city Venice is – if anything the fog and drizzle almost made it seem more magical. Venice is classified as a World Heritage Site, and it’s not hard to see why; canals crisscross the city, gondolas leisurely make their way through waterways, and the stone bridges that link everything together are more than a little idyllic. Venice was one of Europe’s major trading ports until around the 15th century. Today Venice’s industries are shipbuilding, services, and industrial exports. And, of course, tourism. We wandered through the narrow cobblestone streets, popping into small cafes to warm our hands, as we snapped picture upon picture. It’s a challenge not to take photos in Venice; even the most average street corner seems to tell a story. With only two nights there, we tried to take advantage of our time as best we could and hopped on a boat to Burano, a small island about 30 minutes away from Venice by boat. Burano is well known for its lacework and colourful streets. On the boat, we passed by the island of Murano with its glassblowing factories and continued on, passing waterlogged ruins. Burano was blissfully quiet; the only sounds we could hear were the gentle lapping of the tide and the murmurs of a handful of tourists. 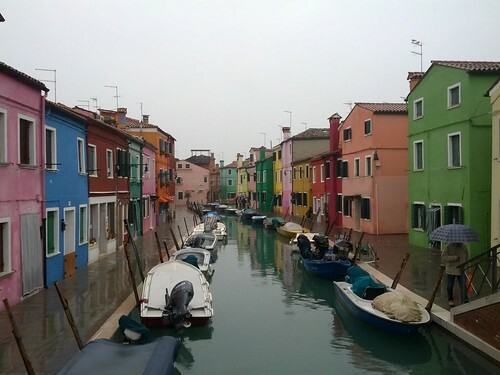 Apparently if you want to paint your house in Burano you require permission from the government – and then you can choose from a selection of approved colours. We wandered down the canals, trying to keep our feet dry against the rising seawater and traded cameras with other tourists, snapping their pictures in front of pink and blue houses. After taking shelter at the ferry boat stop from a torrential downpour, we returned to Venice and found a cheap pizzeria that for two Euro gave me the most delicious slice of mushroom and pepperoni pizza I have ever had. Small dogs in designer raincoats trotted by with their owners in tow as we learned on the edge of Rialto Bridge and watched speedboats cruise up the Grand Canal. We spied through shop windows as artisans created handmade carnival masks from paper and plaster, and admired the intricate and tiny glass animals that were displayed on shelves, all lit from below to show off the lustre and colours. Later on we took in the beauty of ‘the drawing room of Europe’, also known as Piazza San Marco. 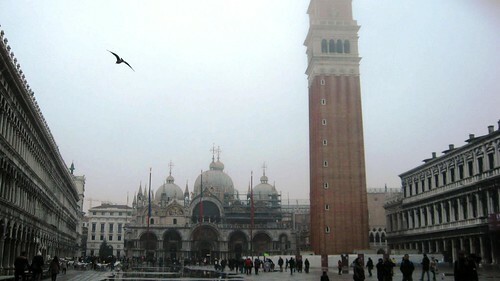 The church bells echoed through the square as pigeons took to the skies and tourists wandered towards the water, snapping photos against a backdrop of gondolas. We followed suit. 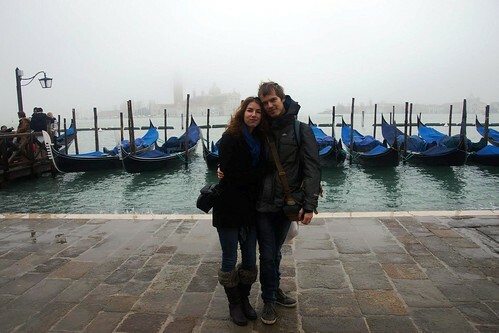 We’ll undoubtedly be heading to Venice again soon, but not in the heat of summer. Venice is a city best enjoyed when you have it to yourself. To view flights to Venice visit our website.